Providing the Northern Virginia area with dependable affordable quality service since 1975! Is your camcorder acting up? There are a million-and-one things that can go wrong with todays mini hand-held video recorders. Ok, well that might be a bit excessive, but there are a LOT of things that can and do go wrong, and we know how to fix them all. 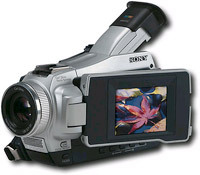 Whether it’s a Digital-8, Hi-8, 8mm, VHS, VHS-C, SVHS, Mini-DV, or Mavica format, or a Sony, Panasonic, JVC, Canon, RCA, GE, Hitachi, or any other brand  our highly trained and skilled technicians are able to diagnose and repair any problem for the home user or industry professional. ©2002-2006 BurkeElectronics.com. All rights reserved.